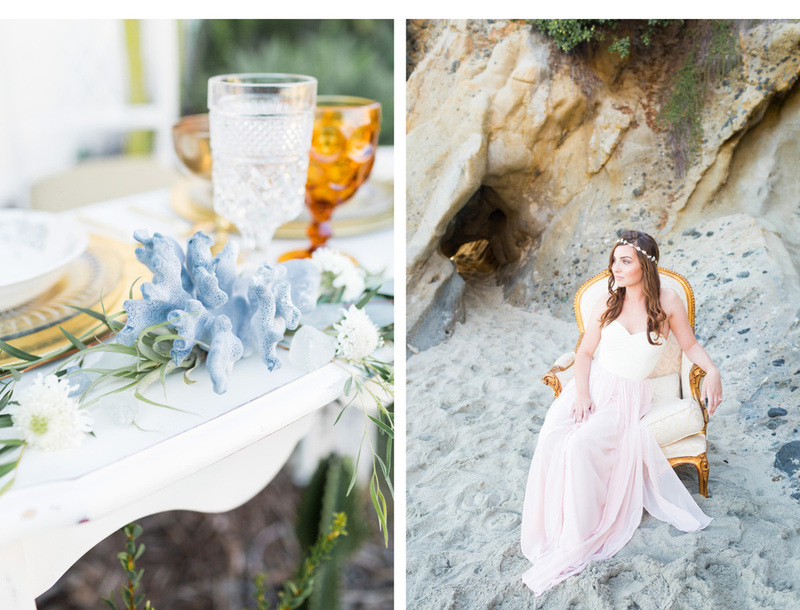 This inspirational day took place at a lovely private home on the seaside cliffs in Laguna Beach, CA. 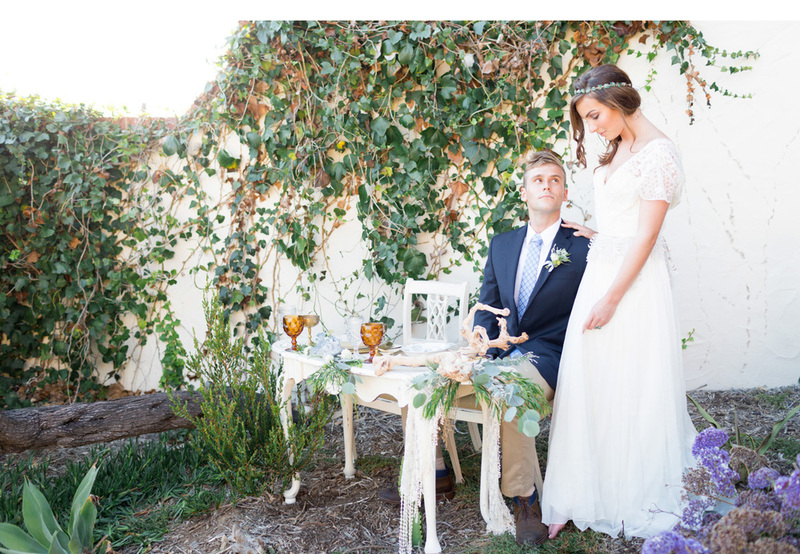 In the backyard, we set up a sweetheart table for the bride & groom - along with all of it's trinkets. It was a smaller space - but it just goes to show you what you can do with fun little plant-covered corners & pretty walls! 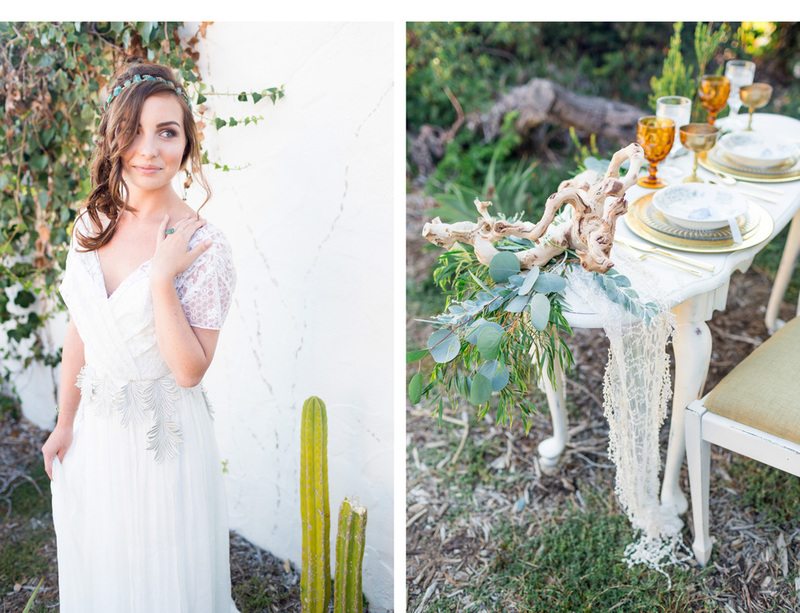 The vibe we went for was a mix between sea gypsy & earthy bohemian, while keeping in mind the transitional season from Summer to Fall. For all the simplistic, unpretentious, yet chic lovers of the natural land & sea, this is for you! 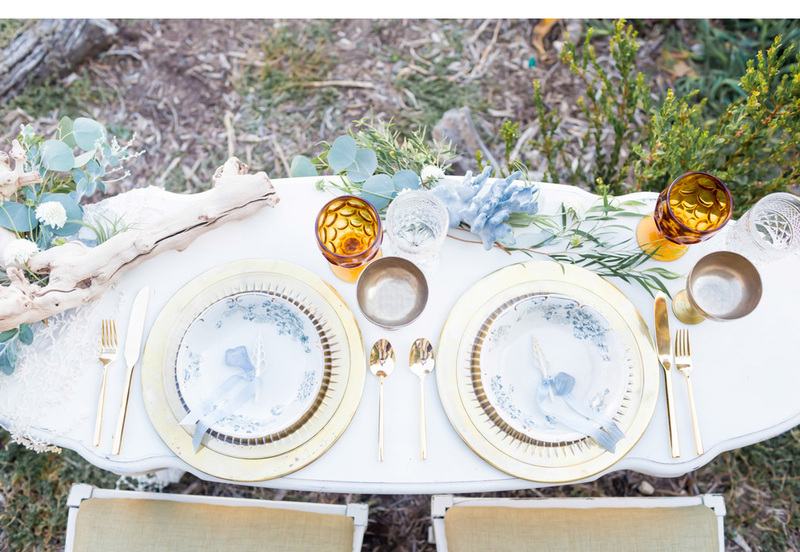 Along with the white furniture, the complimentary color palette was sprinkled across the table & arm chair with different shades of yellows, including gold, copper, & a clayish amber. It also included powder blues found in the coral, the bouquet Indigo & Plum did a beautiful job with, the hand dyed ribbon, and the candles. The yellows hint at Fall, while the blues capture the ending of Summer. 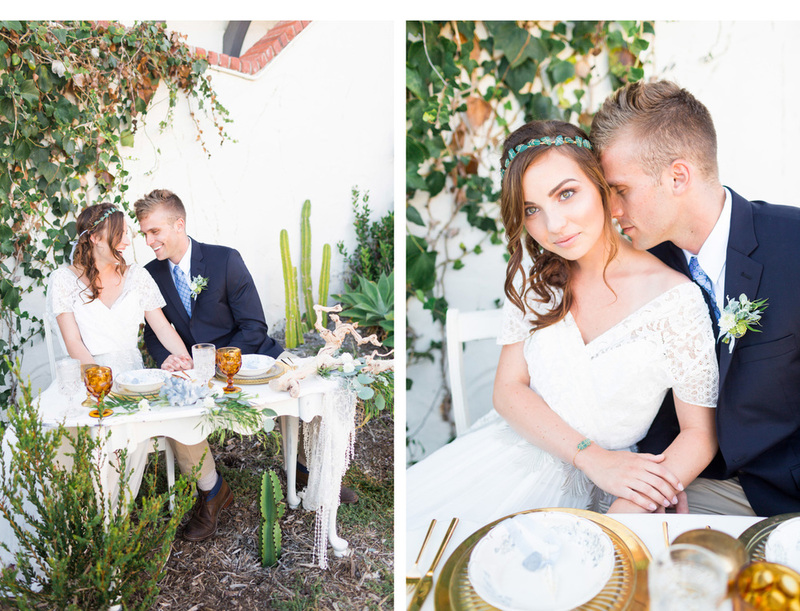 The most exciting detail about this shoot is the sea glass, incorporated into not only the table-scape, boutonnière, & bouquet, but also the bride's jewelry. 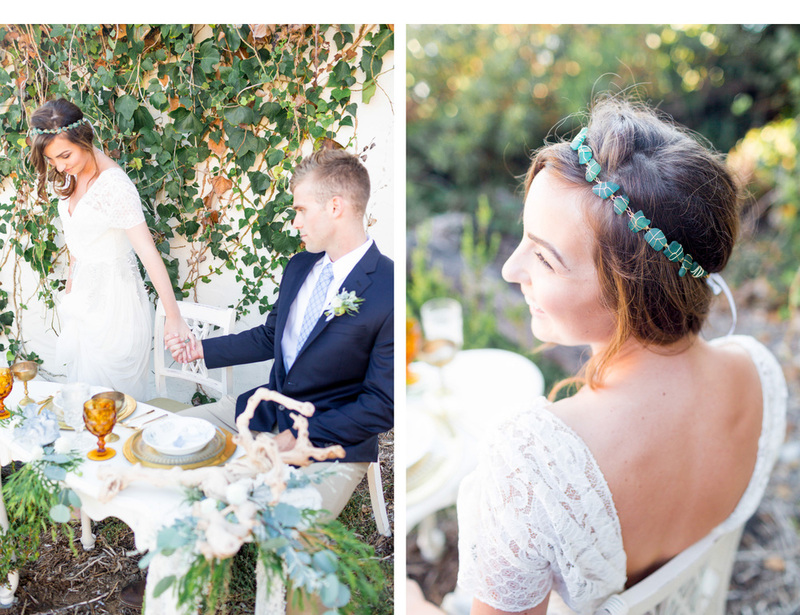 Every bracelet, ring, and bridal crown featured is made of sea glass and gold-plated wire - which makes this evening a very unique production that came to life before my eyes! 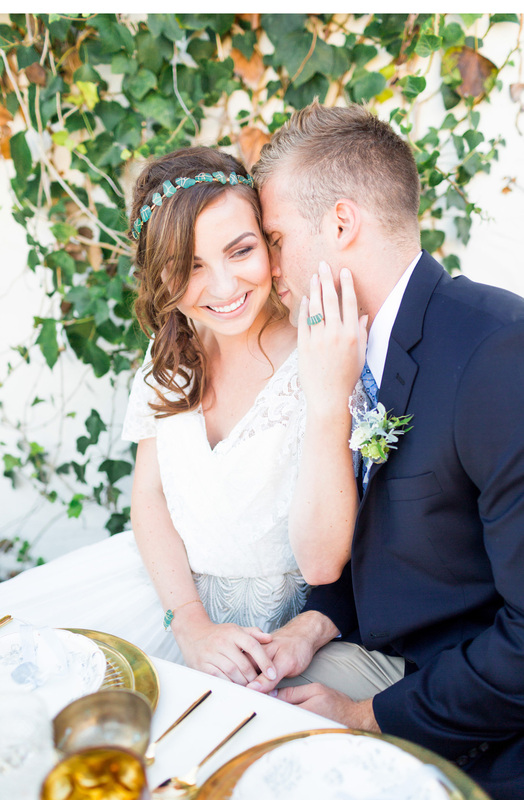 The seaglass bridal headpieces are rare to the industry (deemed by my own extensive research). I couldn't find any elegant, dainty crowns made out of gold wire and seaglass. 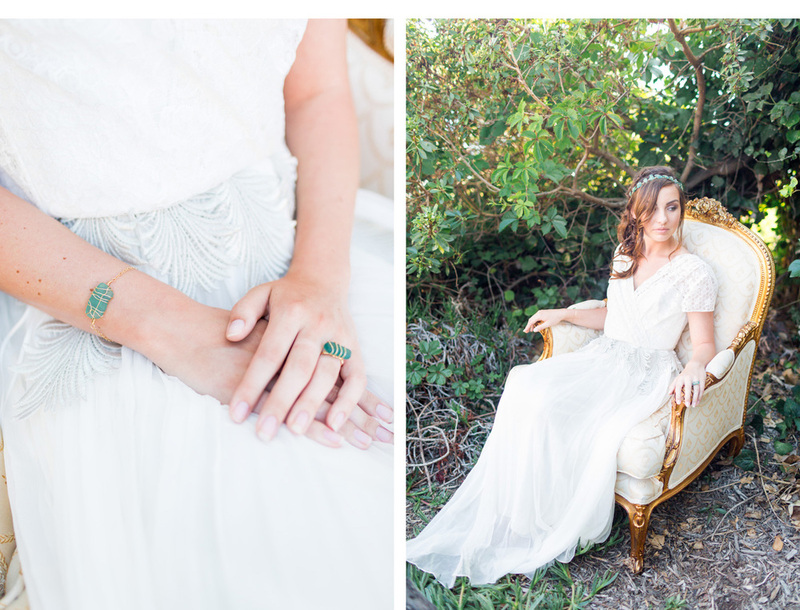 So, I reached out to my friend SeaMaid Market, a jeweler of ocean-finds, and asked her if she would mind crafting some for this styled editorial. They turned out absolutely gorgeous. So different. What I love the most is that they are distinctly for the souls who yearn for the sea, yet they still have a timeless feel & elegant look to them. We captured 3 different shades: teal, clear, and sea foam - with matching bracelets & rings (perfect for bridesmaid jewelry!). Not to mention, a beautiful back necklace also crafted out of sea glass and gold with "something blue" included as the last piece of glass at the bottom. All of these handmade items are available in SeaMaid Market's new bridal section in her etsy shop :). Towards the end of the shoot, we walked down the steps from the house to the beach, and captured a few different outfit options as we strolled the sand. 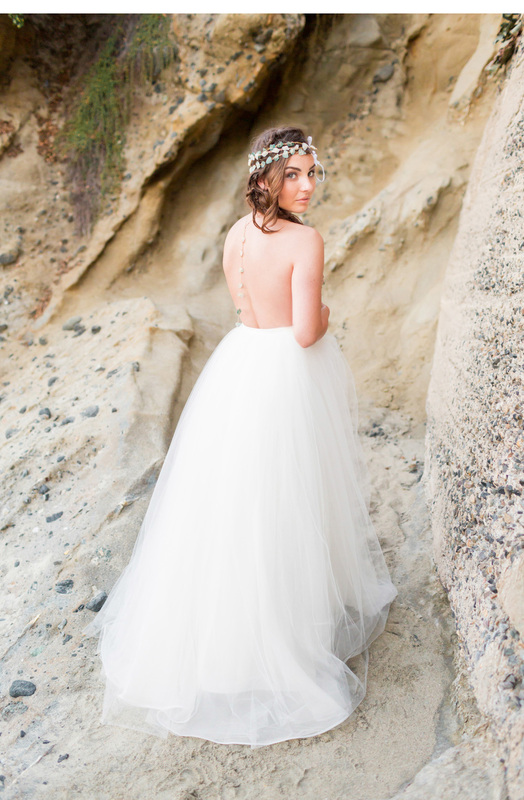 The Pas De Deux tulle skirt & sea glass was absolutely breathtaking, so we spent a little more time down there than expected. We knew the tide was 1 foot away from being the highest tide of the week - but we waited until the absolute last minute we could to return up the cliff! All of us vendors (& the bride & groom) charged around some tide pool rocks in between the crashing of the massive waves with clothes, decor, & equipment over our heads, praying nothing would get wet! Of course, how could everything stay dry when you wait until the last minute? Luckily, the heart-pounding adventure left us with only a few wet pieces (& people), and very big smiles.